Do you grow tropical bonsai? Are you in the northern regions and forced to grow trees indoors under lights? If you are a bonsai enthusiast, and answered yes to at least one of these questions, you may already know Jerry. 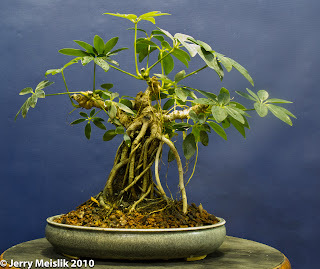 He has written 50+ articles on the subject of bonsai and has made great contributions to the art of tropical bonsai. Jerry believes that bonsai should be created by using the same basic principles of design that an artist or sculptor uses: line, contrast, balance, rhythm, etc., and the effective use of such principles to shape a bonsai should be the key to all bonsai. This is something that I couldn't agree more! Having lived for a while in South Florida, my old stomping grounds, Jerry developed a love for tropical trees in their natural state. I too remember the glorious Banyans, stretching several hundred feet across, ever so majestic and magical. There were a couple of pioneers who helped to get the banyan style rooted in the states, Joe Samuels, Jim Smith, respectively, whose devotion to the art of bonsai is still appreciated to this day. It is in this vein that place the achievements of Jerry. Living in Montana is not where one would expect to find tropical bonsai, but Jerry has quite a few. Living under special halide lights they thrive and get all the special attention they need. Jerry has mastered the indoor bonsai culture to an art in itself. 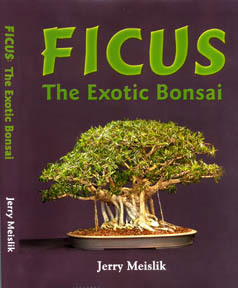 If you are interested in learning more about growing ficus bonsai, you must get his book: Ficus the Exotic Bonsai. It is a great read and a must have for your bonsai library! Well, I was quite honored to have received a commission for a pot for Jerry. Here is the medium sized oval with a beautiful sheffelera in training. With its arial roots it is hard to imagine this guy being grown indoors. I can't even get some of my ficus to grow arial roots in the heat of summer in Florida! Anyway, I still think this tree and pot is quite the lovely combo. Thanks Jerry!